A national Catholic men’s event to be held for the first time in Aotearoa-New Zealand, and hosted in Auckland this September, will offer men an opportunity to come together in faith, to listen, and to improve their lives in areas they care about – faith, family, marriage, work, mates and life generally. 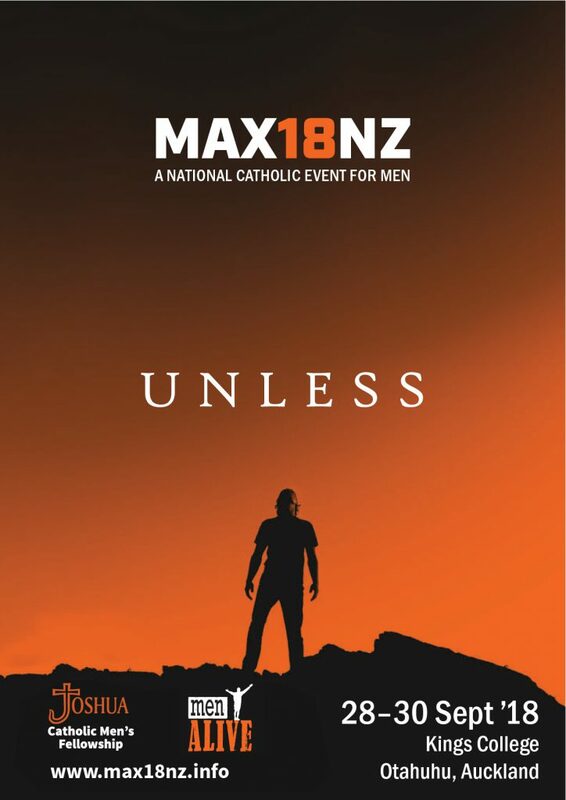 Entitled MAX18NZ, the event is jointly organised by menALIVE and Joshua Catholic Men’s Fellowship. It will run from Friday evening 28 September to Sunday afternoon 30 September, at Kings College Otahuhu, Auckland. NZ – differentiating this MAX event from the Brisbane one. MAX18NZ UNLESS will encourage men to look at various aspects of their Christian journey where ‘Unless…’ might apply. Peter Gabaeur, menALIVE Australia core team. There will also be a choice of workshops about God, personal relationships, parish and Church, life-plans, and Scripture. Masses will be celebrated and there will be an opportunity for the Sacrament of Reconciliation. Subsidies are available for men unable to afford the full cost of attending the event. Contact details are: enquiry@max18nz.info or phone 0272 495378. Go to www.max18nz.info for more information.